«Selling all these pendants, hosts, statues... Is this money? These are pennies for hard work, - sighed languidly the beauty, - if I could receive money for nothing, it could be a quite different business». The Bible teaches that “For the love of money is the root of all evil” (1 Tim. 6:10). The Roman church loves money. In 1190 AD the church began one of the most dirty businesses – sale of Indulgences. 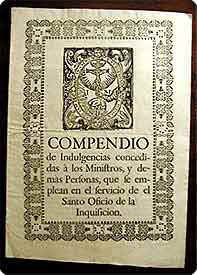 Everyone now could receive the absolution for his sins by buying this "holy" document. Anyone, who intended to make a dirty act, down to murder, bought a pardon and went on murder sure that he paid off his soul out of the hell. Crusaders, going in campaigns against dissenters to the Near East, spent a lot of money for the absolution (in the 20th century the devout members of Italian mafia redeemed their souls, paying the Catholic priests good money from their bloody business). And the church grew rich... Thus, the Catholic Church gave the pope powers of God! The pope instead of God, now managed destiny of people, deciding who is worthy of going in paradise, and who - in the hell. «Oh, pagans do not go to the church, because they have a rest on Sundays in honor of their sun god and on Saturdays they work. Well why should I carry out services on Saturdays? Who cares that in the Bible it is written in such a way? The Scriptures have become outdated. Today we can not carry the Word of God to people on Saturdays» - the prostitute persuaded the emperor. And in March 321AD the emperor Constantine founded the law, according to which Sunday was recognized the official day of rest for the whole Roman Empire. And in 364AD Council of Laodicea announced death for the Christians, who celebrated Sabbath on Saturday, i.e. on the 7th day of the week by commandments of God. Council of Trent in Italy on the 18th of January 1562AD marked: «the Church has changed Sabbath (Saturday) to Sunday not on precepts of Christ, but at own will». “The Church, after changing the day of rest from the Jewish Sabbath of the seventh day of the week to the first made the Third Commandment refer to Sunday as day to be kept holy as the Lord’s Day” (The Catholic Encyclopaedia,Vol.4,p.153). In many translations of the Bible the word "Saturday" was replaced by the word "Sabbath" that is a equivalent replacement itself, however it allowed to the church to change the day, elected by God, to the day Sunday, elected by the devil for the pagan religious rites. Therefore many people who read the Bible did not notice the substitution. Especially the orthodox Russian church, because the week in Russia, as against all countries, begins not with Sunday, but with Monday. Thus, the believers are entered into error, accepting the 7th day of the week as Sunday. However Sunday in Russian get its name from the word which means “resurrection”, because at this day, as is believed, resurrection of Jesus took place (see note on p. 73). But the Bible also says that Jesus’ resurrection took place after Sabbath on the first day of the week (Luke 24:1; Mark 16:2; Mat.28:1), i.e. after Saturday, on the first day of the week which is Sunday. The seventh day of week is Saturday. The Jews, even Russian, till now by ancient tradition celebrate Sabbath on Saturdays ( Is Saturday the 7-th day? - Click on this line for an answer). «But the seventh day is the Sabbath of the LORD thy God» (Ex.20:10) – It is the 4th out of 10 commandments given by God to mankind. James said (2:10), that the infringement of one commandment is equivalent to infringement of all. Non-observance of Sabbath is the sin before God. Sabbath is not only Holiday for the Jews, as some people think, God established Sabbath, when the Jews even did not exist: there were only Adam and Eve (Gen.2:3). And we should not forget that Jesus Himself was God who created the world and established Sabbath (1Col.1:13-16;John 1:1-3,14). The 4th commandments about holy Saturday – Sabbath remains in power. Sabbath can not be included in the ceremonial laws. When Jesus spoke: «The Sabbath was made for man and not man for the Sabbath» (Mark 2:27), it meant that all rigid laws of Moses, concerning Sabbath are cancelled. If earlier in Sabbath nothing was allowed to do at all, and a deviation from this law was punished in many cases by death, now «it is lawful to do well on the Sabbath days» ( Mat.12:12). God nominated this day to listen prayers of people to Him. «For this shall every one that is godly pray unto thee in a time when thou mayest be found» Ps.32:6; «Seek ye the LORD while he may be found, call ye upon him while he is near» (Isa.55:6). Remember, when the Israeli society camp next to the mountain Sinai, God told Moses that in 3 days He would descend the mountain, and people should prepare for it (Ex.19:11). He didn’t say that He will be there, on the mountain, constantly, and Moses can always come to Him. No. He nominated the day. Compare: «in the day when I visit I will visit their sin upon them» (Eх.32:34). Saturday is the day when the All Mighty visits the Earth and hears ours prayers by Himself.